LA made smog and pollution into household words. No longer. Its citizens have said enough. TreePeople, founded by Andy Lipkis, is leading the campaign to plant one million trees in the next decade. Friends of the LA River and the Rivers & Mountains Conservancy are reclaiming the Los Angeles River. They are determined to see the return of steelhead salmon in their lifetimes. To everyone's surprise, Los Angeles is discovering mass transit. Darrell Clarke, Executive Director of Friends of the Expo Line has spent 17 years finally convincing the city to begin building the first east-west light rail-line in Los Angeles in 50 years. Girls Today Women Tomorrow mentors the girls of Boyle Heights, teaching them about nutrition, exercise, and their Latina culture. The community-based program also provides college scholarships in a neighborhood where the drop-out rate is close to 50%. Los Angeles is even planning a 26-acre downtown park thanks to the philanthropic generosity and vision of Eli Broad. Other green projects are being promoted by its 24/7 Mayor, Antonio Villaraigosa, who understands that environmental justice, public health and quality-of-life go together in order to dream a different city. Edens Lost & Found - Seattle - Recognizing that the human community is growing faster than the aging infrastructure, the city of Seattle created an Office of Sustainability and Environment. "[Eden's Lost and Found] Los Angeles: Dream a Different City inspires and instructs everyday citizens to tackle the big problems of sustainability, bit by bit, with effective grassroots initiative. It covers a wide range of angles: from light rail to urban forestry, restoring the L.A. River to developing sustainable lifestyles, and restoring toxic brownfields to developing farmers markets and urban gardening. A terrific resource for classrooms and community meetings alike, for those who live in well-off neighborhoods to those struggling to create environmental justice in areas once devastated by landfills and junkyards." "In a day of increasing environmental awareness, the film hits home. It was especially relevant to us here in San Jose, California, just a few hundred miles north [of Los Angeles] and the 10th largest city in the U.S. It causes for some introspection of our personal actions and behaviors. I am considering biking to work in the future." "Edens Lost and Found: Los Angeles, Dream a Different City shows how individuals can influence their communities and shape the future of their city...If Angelenos can accomplish these endeavors, then perhaps the damage we've done since the dawn of the industrial age is reversible. This film is a tremendous resource for students and individuals interested in learning more about the environmental challenges that face urban areas and how everyday people are making a difference to tackle these problems." "Los Angeles has always been a rich laboratory to urban planning and environmental design students. 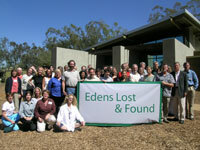 Eden's Lost and Found: Los Angeles captures a variety of related issues and convincingly illustrates how this dynamic metropolis has succeeded in addressing them. The documentary opens up new vistas for city managers, landscape architects, and environmental planners. It highlights the best lessons learned from reclaiming the Los Angeles rivers and mountains, developing downtown parks, and re-discovering the mass transit role in Los Angeles' urban life. This documentary will be of particular interest to professionals working in urban renewal projects or landscape restoration programs." includes 45-page teachers' guide, LA action guide, interview with Jimmy Smits, interview with LA Mayor Antonio Villaraigosa, and preview of the whole series. essionally produced programs will inspire cities and towns all over the United States to use more green building materials, cultivate and employ native trees and plants for landscaping, find ways to practice conservation, and minimize disruptions to the natural environment. Recommended for all collections."